Real Flowers Pressed between Glass heart with decorative metal edges creates a beautiful lovely suncatcher. "MOM" is engraved on a heart charm that hangs. Silver Chain for hanging. Measures 4"H X 3.5"W Approx. 6.5"H When Hanging. MOM BUTTERFLY SUNCATCHER. This is the best mother's day gift set. 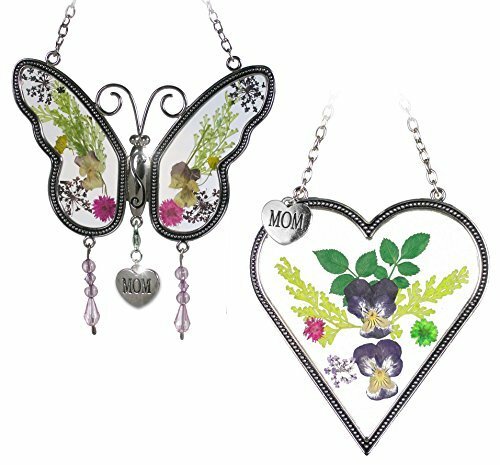 You will receive 1 butterfly suncatcher with MOM engraved on the silver heart charm and 1 heart suncatcher with MOM engraved on the heart charm. Mom will love to hang these beautiful dried flower sun catchers in her kitchen window. GIFT SET FOR MOTHER. In this set you will get 2 suncatchers. These colorful flower hanging sun catchers are made of glass and metal. Each one has a chain already attached for easy hanging. The gorgeous flowers are dried and pressed between the glass panels. SUN CATCHERS. Surprise mom on her BDAY this year. She will love to receive this gift from her favorite son or daughter. SIZE. Butterfly is Approx. 4.25 "x 4.25" Inch. Approx. 8" When Hanging. The heart is 4"H X 3.5"W Approx. 6.5"H When Hanging.